We believe that customer service means answering every roof repair call that we can. That is why our staff is trained in all types of roofs. By helping you with your current leak or repair issue honestly and fairly, no matter what material your roof is composed of, the word will get around. When you need a major repair from a tree falling or moisture damage, you will remember our skill, our courteous and respectful crew and our professionalism. We are a full service roof repair company, which we provide licensed bonds and insured service to the residents and companies to cities all over the valley! There is little to say about the weathering issues of the Phoenix Valley, being that we live in an arid, relatively placid climate. However, with the unpredictability of our monsoon seasons, the valley will often receive heavy rainstorms and dust storms with strong winds sure to cause leaking and roof damage. 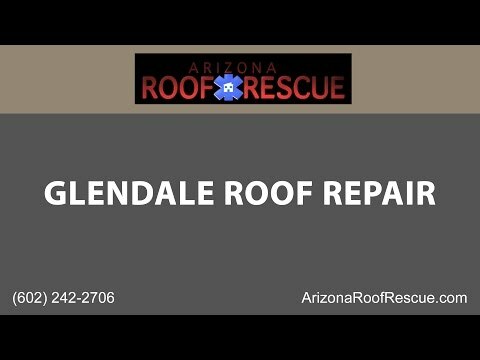 Because the Glendale area is much younger than Phoenix and farther from the rest of the Valley, it is often overlooked by roof repair companies, being that the houses are in newer condition. That, however, is not a viable reason to scan over the area, being that most homes are not prepared for any kind of weather. It is in our duty to answer all roof repair calls, and so we are sure that our staff is trained to repair all roof types including Glendale shingled roofs. Arizona Roof Rescue makes value and quality our primary concern. We are familiar with dealing with insurance companies and can help to expedite claims, we are licensed, bonded and insured and our Glendale roofing contractors are NATE certified. This means that our workmanship is guaranteed. A new level of care and customer service in roofing repair is emerging with Arizona Roofing Rescue at the forefront. Dependability and value is what we give to Glendale.